Co-exclusives: more exposure or just an aggravation? 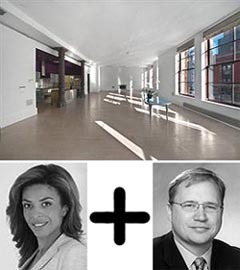 Elliman’s Lisa Simonsen (left) and BHS’s Frans Preidel are selling a unit at 140 Franklin Street. As prices continue to fall and sellers become more desperate to find buyers, the number of co-exclusive listings could increase. But some brokers say sellers who think listing a home with multiple brokerages will bring in more potential buyers have another thing coming. Linda Maloney, a vice president at Stribling & Associates, is selling a $9.4 million penthouse at 1158 Fifth Avenue with Stribling’s Carol Mann, a senior vice president, as well as the Corcoran Group’s Sharon Baum. “[The seller] felt she would get better exposure by using two firms,” Maloney said. However, Maloney said that while having two marketing strategies can be beneficial for the seller, it’s unnecessary because brokers in the city have the same reach. So whether an apartment is listed with one firm or two, the seller will most likely draw the same amount of potential buyers. “It’s more psychological,” Maloney said. Frans Preidel, a vice president at Brown Harris Stevens, concurs. “The reality is we all have coverage and reach the same kind of people,” Preidel said. Preidel is selling a unit at 140 Franklin Street for $7.75 million with Lisa Simonsen, a broker at Prudential Douglas Elliman. Co-exclusives work in many different ways for brokers. Preidel said the preferred commission split is an even 50-50, but in some cases, the broker who finds the buyer can take a higher percentage. And Preidel said that often the brokers work together amicably with little sense of competition. But, of course there are brokers who will cause conflict. Richard Hamilton, a senior vice president at Halstead Property, said for the most part he has sworn off co-exclusives because they are detrimental to both buyers and sellers. “There’s too much potential for conflict, and it’s not a good idea for owners,” Hamilton said, adding that when his clients have asked for a co-exclusive, he tells them to pick one agency or the other. Hamilton said in a case where the broker who finds the buyer receives a higher commission, it becomes a competition for the money, and the seller’s interests take a back seat. “They’re not working 100 percent for the owner when their own personal interests are involved,” Hamilton said. While listing a home with different brokerages may not always bring in more would-be buyers, and could just be an aggravating way for a brokerage to get a commission split, during the downturn, some say it can’t hurt to try it out. “In today’s market, everyone’s looking to do something to help move deals forward,” Elliman’s Simonsen said.